Try these instead of sandwiches in your lunchbox! Preheat oven to 375 F. Line 2 cupcake pans with paper muffin lines. In a large bowl, mix together flour, baking powder, baking soda, salt, basil, oregano, and sugar. Mix in green onions, pepperoni, and 1 c cheese. In a smaller bowl beat the egg, then whisk in the buttermilk. Add the buttermilk mixture to the flour mixture and stir to combine thoroughly. Spoon batter into paper lined muffin cups until half full. 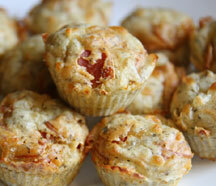 Sprinkle remaining 1 cup of cheese on top of muffins. Bake at 375 for 15 minutes or until a toothpick inserted in the center comes out clean. To make jumbo pizza muffins, use a jumbo muffin tin (sprayed with cooking spray) and increase the cooking time by a few minutes. Watch closely to make sure muffins don't overcook and dry out. Insert a toothpick to check for doneness. Cool muffins, individually wrap in plastic wrap, and freeze in a large zip top bag. Place one or two muffins in a lunchbox to defrost for lunchtime.